Here at Sunnybank Hotel we offer a relaxed atmosphere where you can meet with family and friends for a meal or just hang out in our Sports bar and unwind after a hard day at work. Our Graziers Steakhouse offers a family friendly and informal dining experience which has become a favourite for locals and visitors alike. Many diners choose to take advantage of the quality steaks cooked on the char-grill, and we offer and extensive range of dishes for those who want something a little different at affordable prices. Our kids meal options are sure to please the little ones and children can play in the safety of our kids entertainment room. Our al fresco areas provide a great opportunity for patrons to enjoy our sunshine state. If it's a friendly relaxed environment you are looking for then you're sure to enjoy visiting the Sunnybank Hotel. Sunnybank Hotel is the closest venue to QSAC Stadium (15 minutes walk) so why not enjoy a meal and drinks before a concert or event on at the Stadium. Here at Sunnybank Hotel our Graziers Steakhouse offers a relaxed family friendly and informal dining experience. Accommodating dining seating for up to 130 people, Graziers Steakhouse is a favourite place for locals and visitors. 100% Australian beef which is fresh and chilled, never frozen. 100% Australian chicken, hormone and antibiotic free, fresh and from cage-free farms. 100% Australian fresh seafood from sustainable fish stocks. Sow Stall free pork that is also hormone and antibiotic free. 98% Australian grown fresh fruit and vegetables. Let the kids amuse themselves in the safety of our kid’s entertainment room whilst you grab a seat, sip on a beer or a glass of vino and enjoy the alluring satisfaction of Graziers Steakhouse Bistro. The iconic Stadium Bar owes its name due to its proximity to the old QE2 Stadium which hosted the 1982 Commonwealth Games in Brisbane along with Broncos home games and along with AC/DC. This bar has a strong sporting tradition as both host and a place to view live sporting events both local and international. Where possible we have all events live. There are 15 x 50" TVs as well as a 3m x 8m big screen projector to watch all your favourite sports events. With five Ubet terminals for the punters, our Stadium Bar is the place to meet with friends and catch up on all your favourite sports action. You will find our gaming room is very spacious and comfortable with a host of linked jackpots including Lightning Link machines. We also have a vast array of other in-house jackpots for you to experience. A selection of snacks and food items are served throughout the day plus free tea, coffee, and soft drinks to our patrons. 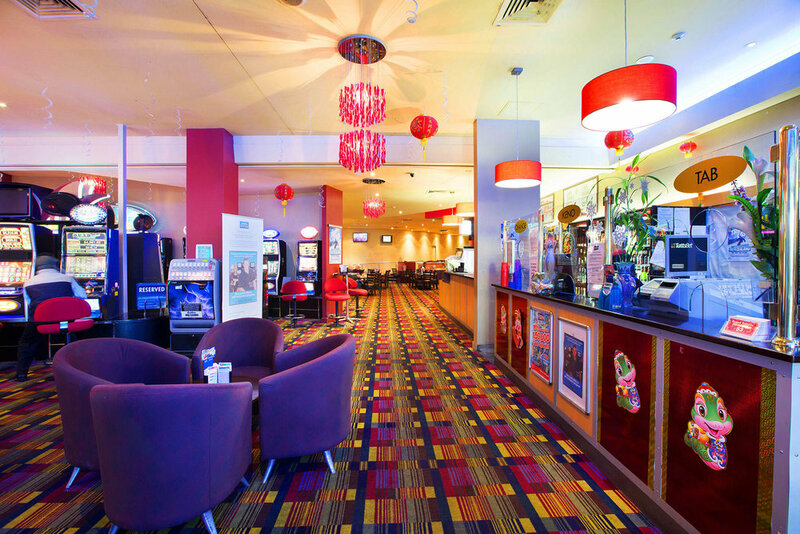 Sunnybank Hotel has exceptional service and gaming promotions each week sure to make experience here one of the best in Brisbane.